There are many jewelry making publications which typically focus on just one type of jewelry making like bead work or wire work. But many people - myself included - are keen on using different mediums and techniques. So if you are multi-disciplinary, you might well be interested in this quarterly publication. art and crafts publications. They call it a magazine but at 144 pages, the issues are more like books. 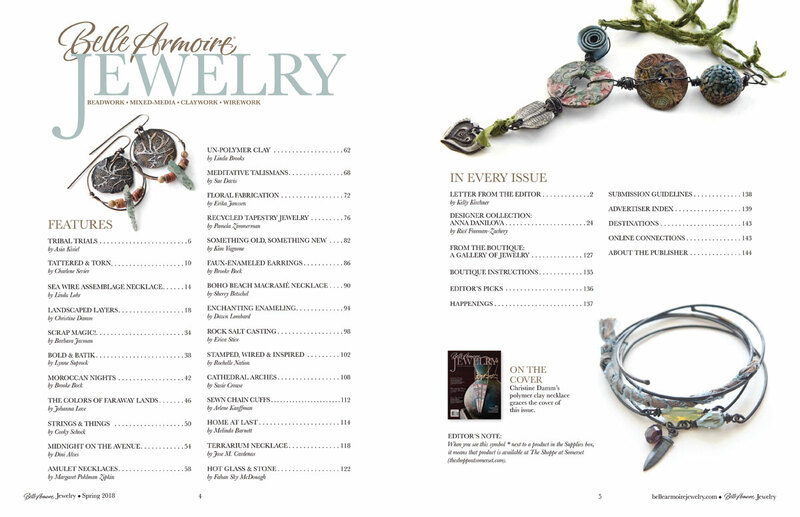 I recently received a copy of the Belle Armoire Jewelry Spring 2018 for review. My first impressions was an issue packed with projects, tips and loads of inspiration. There were 26 main projects in all which involves several different techniques - beadwork, mixed media, resin, resin clay, polymer clay, wire work, enamelling and metal work. Some designs combined techniques. Like many jewelry making magazines, submissions are welcomed - clear guidelines are at the back. So every issue is in reality a beautifully curated and balanced selection of designs. There was something for everyone, except perhaps glass artists! I chose examples to illustrate the incredibly broad range this publication covers. A truly difficult task because there were so many outstanding designs. Some, but not all of the projects, included step by step images. This was obviously a compromise in order to have so many projects and articles in the book. Others had detailed written instructions with some assumptions. If you are familiar with the technique, the instructions will be easy to understand. But beginners will need to do more research. Indeed, tips at the end of the projects sometimes included information on how to get started. For example, one of the metal work designers, Susie Crouse, mentioned the online videos of Mark Nelson of Rio Grande and Nancy Hamilton for those just getting started. 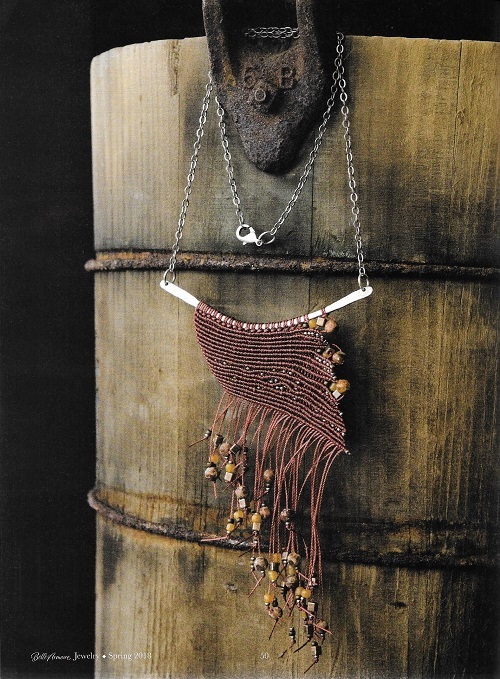 Sherry Betschel, a macrame jewelry designer, recommended redheart.com for basic macrame knotting. (Note : I spotted a rare typo - it reads reheart.com in the magazine which is incorrect). 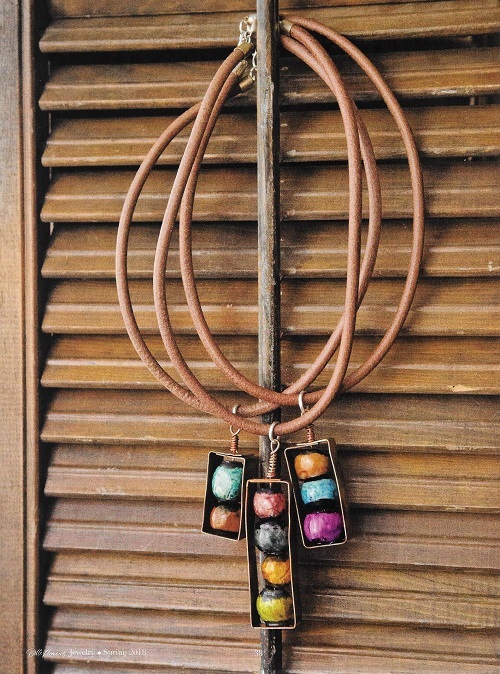 The magazine also has a featured designer - in this case, Anna Money Jewelry. 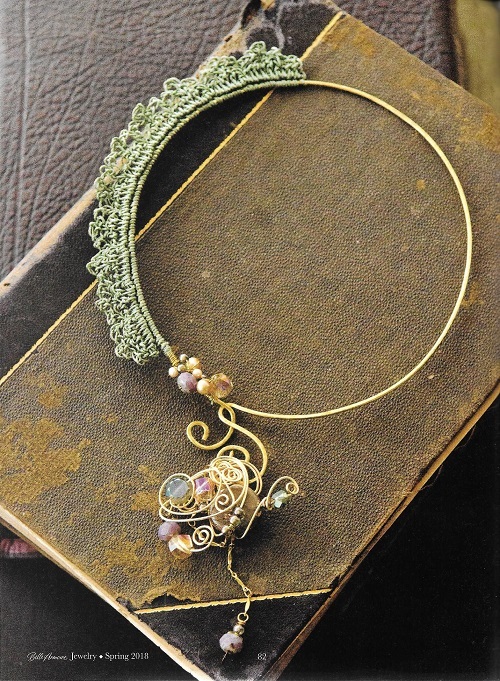 There is also a Boutique Gallery at the end of the book which featured a further 8 gorgeous designs. The instructions for each of these were much briefer - just in paragraph format. But these describes how each design was constructed. The photographs in this book were truly inspirational! 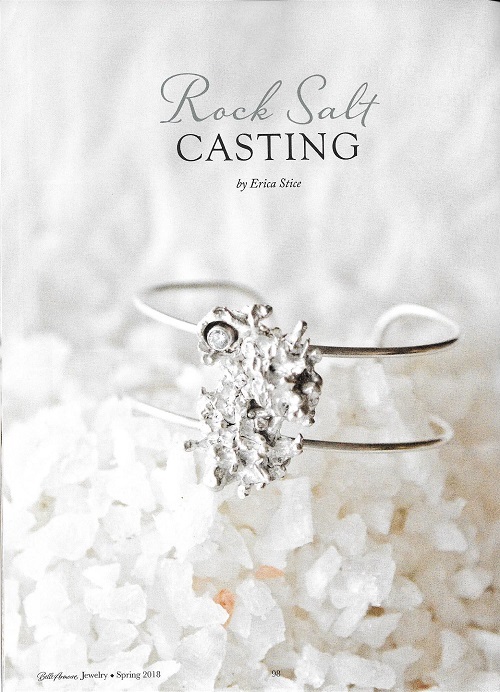 If anything, this publication encourages and inspires jewelry makers to explore other techniques. 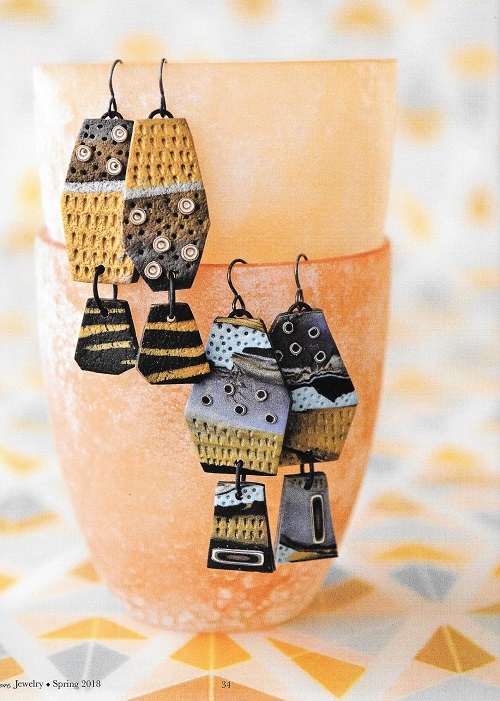 If you are a jewelry making "polyglot" who wants to continue to grow and learn to "speak" different styles, Belle Armoire Jewelry might just be the magazine for you. If you'd like to win this giveaway for a copy of Belle Armoire Jewelry Spring 2018, please make a comment below. Make sure you leave contact info below if you do not have an online shop or blog. It ends in a week's time at 6 pm EST Monday, April 2, 2018. I will pick the winner randomly and announce the results as soon as possible after. So be sure to leave a contact email if you don't have an online link or make sure you come back and check! Otherwise I will redraw in a week. Good luck! What a great magazine! 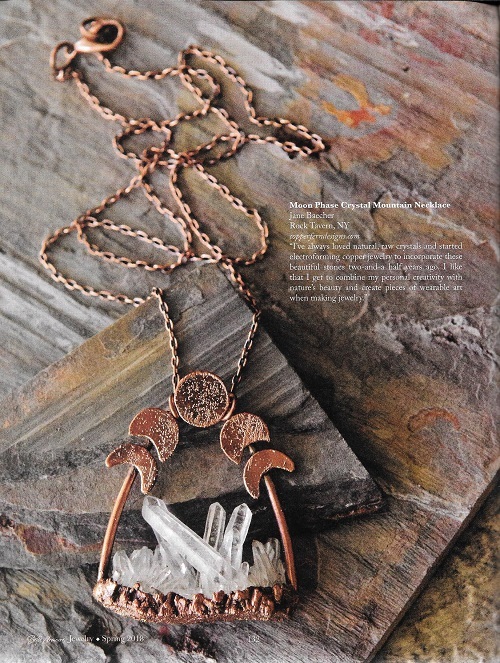 Loved the Moon Phase Crystal Mountain Necklace. 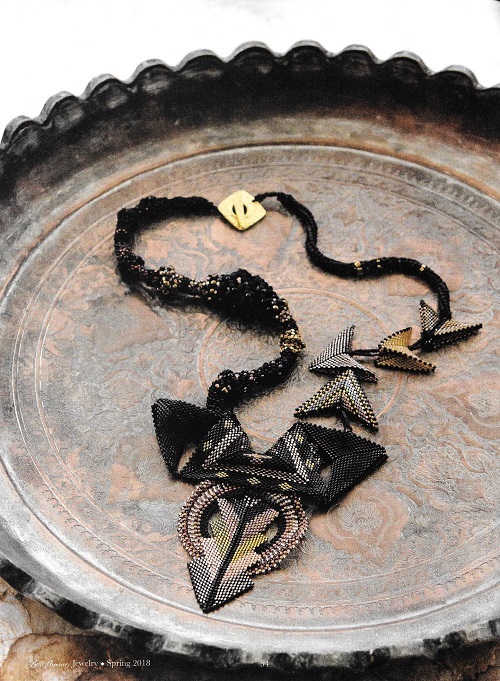 The idea of a multi-media jewelry magazine is awesome. Wow, this is quite interesting, I will have to add this to my wishlist! I'm always on the look out for new magazines to inspire and offer new ideas for me. Several years ago I picked up one of these magazines in a bookstore while waiting for my husband. I was really excited by the photographs in an article I read, so brought it home with me. Was really thrilled when I read the whole magazine.....lots of good information. By the way, that article I loved got me started with shibori, a dye process I still use today with my silk paintings. This looks like an excellent resource for techniques and inspiration.I'll look into getting a subscription. Especially inspired by the crochet piece. I'd love to curl up with this magazine and a cup of tea and indulge my inspiration muse. 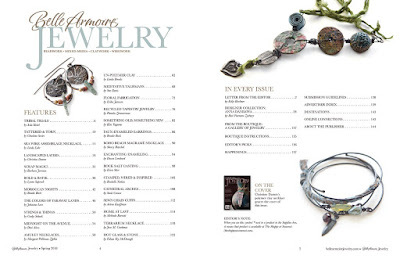 Belle Armoire Jewelry and Jewelry Affaire are the only 2 magazines I get now in relation to jewelry making. I'm always on edge looking for when the next publication will make it to the nearest Chapters. Since they only get in 3 - 6 copies I'm always afraid I'm going to miss out on that quarter's publication and often do. I have a large collection of these magazines and I go back to them almost daily for inspiration. The variety of projects and how-to's are endless and the designs are always so gorgeously photographed. My only wish is that I lived somewhere where a subscription to this magazine was cheaper then what is offered by Stampington for Canadian customers. Otherwise I'd have a subscription and wouldn't have to worry about missing another issue. By far my most favourite magazine going. I get so tired of hearing the conventional wisdom "pick a technique/style and stick with it". It's great to see a publication that celebrates the technique junkies among us! I love publications that explore many techniques. It inspires you to push the envelope and dabble in things you may have not thought to try. Thank you for bringing attention to this magazine. I certainly would want to subscribe now. 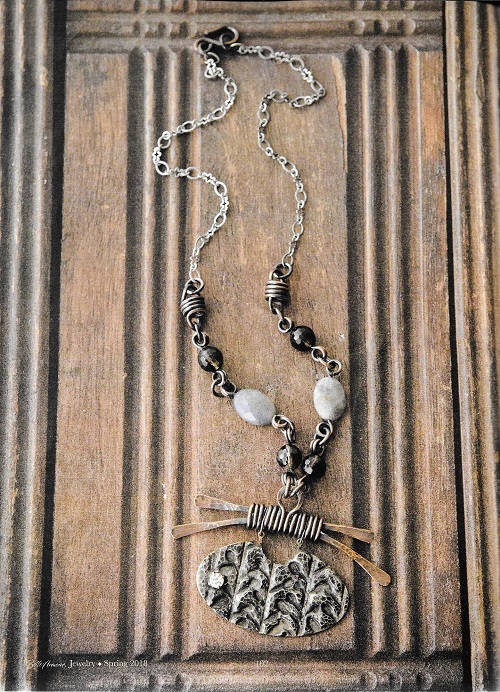 I love Belle Armoire Jewelry and would love to win this copy! Thanks for the chance. I also really enjoy reading your blog. So many cool ideas and eye candy. Would love to win this book and there are beautiful ideas to try. Thanks for another chance to win something great. One of my favorite magazines. I am inspired by the tidbits you shared with us. FB follower and blog subscriber. Oh Wow! I wasn't even aware that they were still publishing since so many had quit. 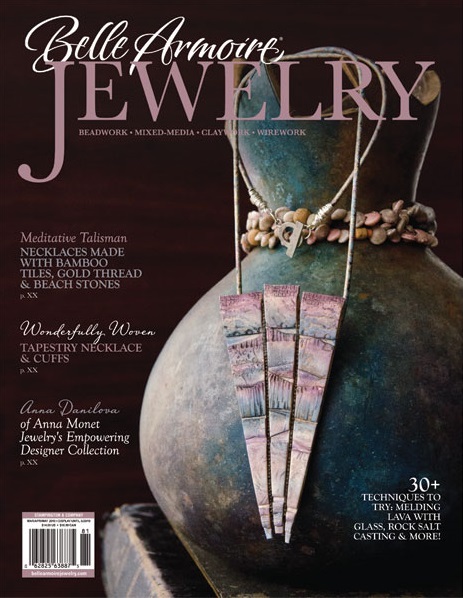 This has always been one of my favorite jewelry magazine so I would love to enter. And, I've scheduled twitter to share this post tomorrow. @CraftyHope on twitter. Saw it on the shelves last weekend and really like the articles. Would love a copy of my own! Thanks! Love this mag! Can't wait to see all the projects! oh my my! i am impressed with what little i have seen of this book. I have heard about this magazine for a while. It looks fabulous. Wish I could win a copy. I have an address in US. I follow you on Bloglovin Pearl. Thanks for all the inspiration. Looks like an inspirational magazine. Would love to win a copy! I may subscribe anyway. Thank you! Such a great magazine I would love to win it! This is by far, one of the higher class jewelry magazines. I really wish they were a monthly publication. The Stampington company always, always has wonderful publications. They offer a scrumptious layout of different and challenging designs. This magazine and the Jewelry Affaire are my favorite muse. Thank you for highlighting this great publications! Now I just have to strive to become a muse to others by getting one of my designs in the publication!